Ranbuild Great Southern are your Accredited Ranbuild dealer based in Albany,WA. We sell all types of sheds, garages, rural sheds, carports, garaports and are commercial shed experts servicing the greater southern WA region including Albany, Mount Clarence, Mount Melville, Yakimia, Collingwood Heights, Little Grove, Robinson, Torndirrup, King River,Willyung, Kalgan, Redmond, Walpole, Mount Barker,Katanning, and Bremer Bay. When you choose a Ranbuild shed from Ranbuild Great Southern you are guaranteed the best building and service backed by our many years’ experience in the industry. We combine the best materials, design and service to ensure all our customers are truly satisfied. All Ranbuild buildings can be designed for single or multiple garages, carports, farm buildings, workshops, industrial buildings, barns and shelters. We sell sheds from the standard range or we can customise the design and engineer a building to your specifications. Our shed designs now extend to the new skillion range and we also offer sheds with eaves for greater weather protection. Unlike others on the market, Ranbuild sheds, garages, carports and commercial steel buildings are made from quality Australian BlueScope steel and are fully bolted together for strength and durability. 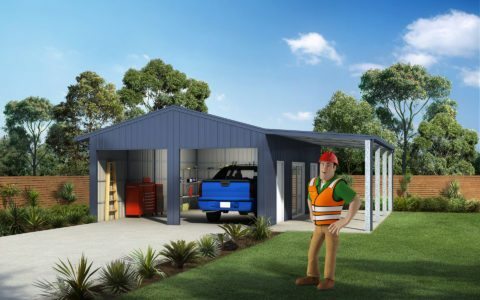 Your Ranbuild shed comes complete with steel work, Colorbond® roof and wall sheeting, all flashings, gutters and downpipes, fasteners, bolts and fittings. We can easily arrange construction for you or you can DIY with our comprehensive and easy to understand construction manuals and plans. Our shed designs are modular, meaning you can extend your shed at a later date due to our identical portal frame design, no structural modifications are needed. Being licensed and fully insured builder, Ranbuild Great Southern are able to supply a complete “turnkey” service from council approval process, right through to the completed shed, giving you peace of mind when dealing with one company to deliver your completed project. Ranbuild really is the leader in the shed industry and offer you a better built and better backed shed. So if you’re looking for garden sheds, farm sheds, garages or steel kit homes for sale in the Albany region, contact us today for a free quote. See our most popular range of single, double, triple garages, carports and more.